Clan Donnachaidh Society News - Society Struan Kirk E.G.M. I’m following up on the appeal letter sent out from our Chief and the Society’s Chairman last September and am happy to be able to report very good news. In summary, enough money has now been committed for the purchase of the Kirk from the Church of Scotland - and the setting up of an independent new Trust to own and preserve it - to go ahead at the end of March 2018. This is subject only to the Society’s membership giving approval to the proposals, at an Extraordinary General Meeting (EGM) which will take place in Edinburgh on 3rd March, for its share of the funding. I now attach the formal Notice & Agenda for the EGM which details the two Special Resolution that we are proposing to the Ordinary Members. Your Council unanimously recommends approval of the resolutions set out in the attached documentation, which also have the Chief’s full support. Ordinary Members overseas don’t need to attend the meeting, as we are confident of attendance by enough U.K.-based members to meet the formal requirements for the necessary quorum in our Articles of Association, and to get the resolutions passed. However, proxy support is of course welcome. Hence the attached paperwork, which should be self-explanatory, if you wish to vote. The resolutions require to be passed by no less than 75% of the Ordinary Members present, in person or by proxy, at the EGM. About three quarters of the total funding needed (our target total is not less than £Stg75,000) has been committed by a small number of Clan-Donnachaidh-related individuals/families as foreshadowed in last September’s appeal letter. They prefer to remain anonymous, but all have whole-heartedly agreed the principles on which the Trust is being set up. See below. It is proposed that the balance will be met from a combination of what the Society’s membership has already raised (a very big thank you to the many who have contributed already) or will have raised by the end of March (to anyone still hesitating, please don’t any longer ! and to all still engaged in branch fund-raising efforts, please don’t stop !) plus proceeds of the sale of a small proportion of the Society’s stock market investments. This too has been unanimously approved by your Council. a. 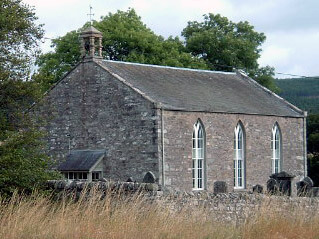 Its formal purposes will be to own, manage and maintain the Kirk, principally as a place of worship, but also to preserve its heritage as a building of special historic and architectural interest, to promote its history particularly in relation to Clan Donnachaidh and its member families, and also to provide a facility for the local community to hold events that are sympathetic and respectful to the sentiment of the Kirk as may be approved by its Board of Trustees from time to time. These purposes will be enshrined in the Trust’s Articles of Association. The exact wording can be found on the attached formal EGM Notice and Agenda. b. It will take the legal form of a Company Limited by Guarantee without Share Capital. This means that the new Trust will not have shareholders or share capital. The new Trust will have a board of Trustees, who will also be the members of the company (in a legal sense). c. There will be up-to 5 Trustees on the board, one of which will be appointed by the Clan Donnachaidh Society, and one of which will be co-opted by the board of Trustees. The remaining 3 Trustees, who currently form the steering group, and are working hard to form the new Trust in order to realise this project, are all individuals who are known to support the formal purposes and some of whom will have been major donors to this project. d. Each Trustee will have one vote only, with an 80% majority required for any major decisions to include any departure from its original purposes, or any decision to wind-up. e. In the event that the Trust were ever to wind-up or dissolve the assets of the Trust can only be transferred to another organisation with similar objects (if the Trust were a charity at dissolution the recipient will require to be a charity). d. sufficient money and/or promised support to help the new Trust meet what are likely to be rather modest annual sums for future maintenance. The figure of (up to) £20,000 in the first resolution for the EGM is the amount which the Society would be donating now toward these costs.